The Pawnee people inhabited areas along the Platte river in now central Nebraska. 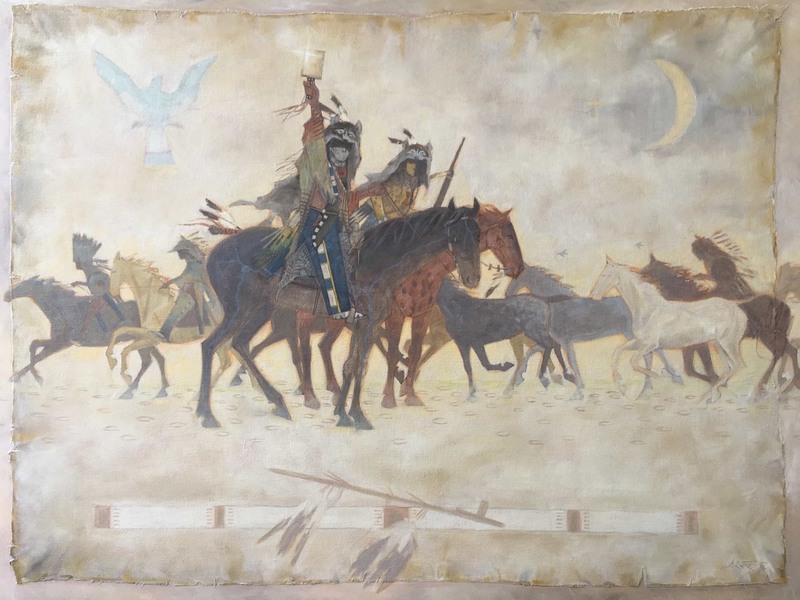 With the migration of the Cheyenne bands from the north in about 1825, the two tribes clashed, creating disagreement and sending the pipe to war on each other. At this same period the Cheyenne had divided into the Southern and Northern groups, allowing them to cover a large area of hunting grounds from present day South Dakota to Nebraska. The scouts of the Cheyenne war parties were often called Wolves. They wore actual wolf robes to conceal their identity and captured the talk and medicine of the animal. Each individual Wolf adorned his cape with his own medicine and bird feathers. His personal power contributed to the wishes of the war pipe and its society leader. In this painting, it is the end of the spring moon phase (Crescent Moon). Good strong medicine is in the sky (Blue Eagle). The pipe is smoked and a raiding party is chosen (Pipe). Pawnee horses have been grazing on land disputed by the Cheyenne along the Platte river. Their ponies are fat and it’s a good time to raid. It will give an opportunity for the young braves to test their horse-stealing skills.The Cheyenne attack the horses, keeping place and rubbing out more than a few Pawnee.Seasoned warriors will stay some distance behind, defending the horse raiders. It would be a good chance to battle and gain some honors against the Pawnee, if the Pawnee choose to fight. The two Wolves up front are messaging a nearby Cheyenne war party with a mirror. Signaling…we have the ponies. Move out quickly towards the river.